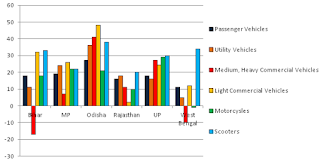 Low per capita income states such as Bihar, Madhya Pradesh, Odisha, Rajasthan, Uttar Pradesh and West Bengal, have witnessed automobile volume growth in the current fiscal, credit of which goes to the equalizing effect of GST, rising female literacy and people having more money to spend in rural areas. The per-capita income of the six states ranges from $990 to $1,600 compared with India’s average of $1,800 thereby they account for a third of the country’s GDP. In various categories in the first half of the current fiscal, these six states outperformed industry growth by 7-15%. 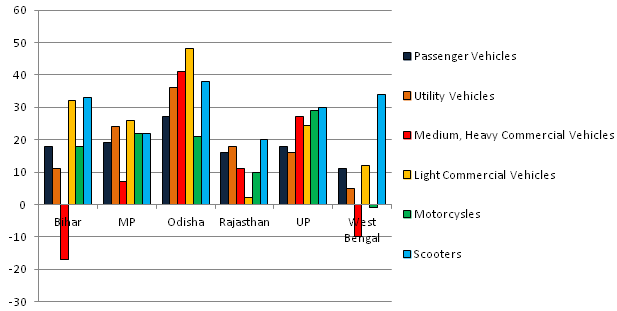 The states account for nearly 23-45% of total sales volume depending upon the vehicle category. Monsoon along with GST helped the demand for automotives boost, as having a good monsoon season in rural areas create a positive effect in consumer sentiment towards the ownership of vehicles. Also, prior to GST, producing states had a tax advantage of 3-5 percentage points. After remaining flat year-on-year in the six months to September 2016, real rural wages grew 3.3% in the second half of the last fiscal. It improved by 4.6% in April-September 2017, the fastest pace in four years. The number of schemes covered under DBT has increased from 59 in FY16 to 140 in FY17. It has further gone up to 393 in FY18 so far. Further in addition to this, government targets to cover all 534 schemes under DBT by March 2018. In some areas especially West Bengal, rising female literacy is said to be a driving force as more girls and women take to scooters for mobility resulting in the growth of automotive demand in the area. With increase in new automotive sales in the area, used vehicles and equipment also witnessed the boost. Shriram Automall India Limited (SAMIL) being the No.1 used vehicle andequipment provider, while anticipating the consumer demand in and nearby these areas, provided them with the best in class used vehicles and equipment of every make and model. So, what are you waiting for? If you want to acquire your desired car, bike, scooty, truck etc. at optimal prices, go for SAMIL used range, as while acquiring used, you don’t have to worry about its value being depreciated or it being hard on your pocket. Hurry and click the link below to register or download MySAMIL Mobile App to learn more about us.